Samudra manthan by the Kurma (tortoise) avatar of Vishnu, with snake rope and mountain, artwork at the Bangkok Airport in Thailand. The samudra manthana (Sanskrit: समुद्रमन्थन, lit. churning of the ocean) is one of the best-known episodes in the Hindu philosophy narrated in the Bhagavata Purana, in the Mahabharata and in the Vishnu Purana. The samudra manthana explains the origin of amrita, the nectar of immortality. Sāgara manthana (सागरमन्थन) - Sāgara is another word for Samudra, both meaning an ocean or large water body. Kshirasāgara manthana (क्षीरसागरमन्थन) - Kshirasāgara means the ocean of milk. Kshirasāgara = Kshira (milk) + Sāgara (ocean or sea). Indra, the King of Svarga, while riding on the elephant Airavata, came across Sage Durvasa who offered him a special garland given to him by Shiva. Indra accepted the gift and placed it on the trunk of the elephant as a test to prove that he was not an egoistic deva. The elephant, knowing that Indra had no control over his own ego, threw the garland on the ground. This enraged the sage as the garland was a dwelling of Sri (fortune) and was to be treated as a prasada or religious offering. Durvasa cursed Indra and all devas to be bereft of all strength, energy, and fortune. In battles following the incident, the Devas were defeated and the Asuras, led by Bali, gained control over the universe. The Devas sought Vishnu's help, who advised them to treat the Asuras in a diplomatic manner. The Devas formed an alliance with the Asuras to jointly churn the ocean for the nectar of immortality and to share it among themselves. However, Vishnu told the Devas that he would arrange for them alone to obtain the nectar. The churning of the Ocean of Milk was an elaborate process: Mount Mandara was used as the churning rod, and Vasuki, a nāgarāja who abides on Shiva's neck, became the churning rope. The Asuras demanded to hold the head of the snake, while the Devas, taking advice from Vishnu, agreed to hold its tail. As a result, the Asuras were poisoned by fumes emitted by Vasuki. 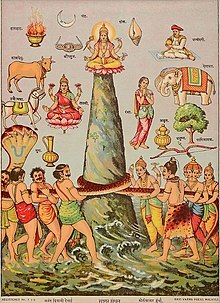 Despite this, the Devas and the Asuras pulled back and forth on the snake's body alternately, causing the mountain to rotate, which in turn churned the ocean. When the mountain was placed on the ocean, it began to sink. Vishnu, in the form of the Kurma turtle, came to their rescue and supported the mountain on his shell. The Samudra Manthana process released a number of things from the Ocean of Milk. One was the lethal poison known as Halahala, which in some versions of the story, escaped from the mouth of the serpent king as the demons and gods churned. This terrified the gods and demons because the poison was so powerful that it could destroy all of creation. Then the gods approached Shiva for protection. Shiva consumed the poison to protect the three worlds but it burned the throat of shiva. As a result, his throat turned blue and was hence called Neelakantha (the blue-throated one; "neela" = "blue", "kantha" = "throat" in Sanskrit). Lakshmi: the Devi of Fortune and Wealth, who accepted Vishnu as Her eternal consort. Apsaras: various divine nymphs like Rambha, Menaka, Punjisthala etc., who chose the Gandharvas as their companions. Varuni: taken - somewhat reluctantly (she appeared dishevelled and argumentative) - accepted the Asuras. Kamadhenu or Surabhi (Sanskrit: kāmadhuk): the wish-granting cow, taken by Brahma and given to the sages so that the ghee from her milk could be used for Yajna and similar rituals. Airavata and several other elephants, taken by Indra. Uchhaishravas: the divine seven-headed horse, given to Bali. Kaustubha: the most valuable ratnam (divine jewel) in the world, worn by Vishnu. Parijat: the divine flowering tree with blossoms that never fade or wilt, taken to Indraloka by the Devas. Sharanga: a powerful bow, symbolic of the Asuras' belligerence. Chandra: the moon which adorned Shiva's head. Halahala: the poison swallowed by Shiva. Finally, Dhanvantari, the heavenly physician, emerged with a pot containing the amṛta, the heavenly nectar of immortality. Fierce fighting ensued between the Devas and the Asuras for it. To protect it from the Asuras, Garuda took the pot and flew away from the battlefield. The Devas appealed to Vishnu, who took the form of Mohini and, as a beautiful and enchanting damsel, distracted the Asuras; then, she took the amṛta and distributed it among the Devas, who drank it. An asura named Rahuketu disguised himself as a deva and drank some nectar. Due to their luminous nature, the sun deva Surya and the moon deva Chandra noticed the switching of sides. They informed Mohini who, before the nectar could pass the asura's throat, cut off his head with her discus, the Sudarshana Chakra. However, some of the nectar had managed to get down his throat and he did not die: from that day, his head was called Rahu and his body Ketu, which both later became planets. The story ends with the rejuvenated devas defeating the asuras. The medieval Hindu theology extends this legend to state that while the Devas were carrying the amṛta away from the Asuras, some drops of the nectar fell at four different places on the Earth: Haridwar, Prayaga (Prayagraj),. Trimbak (Nashik) and Ujjain. According to the legend, these places acquired a certain mystical power and spiritual value. A Kumbh Mela is celebrated at these four places every twelve years for this reason. People believe that after bathing there during the Kumbha mela, one can attain moksha. While several ancient texts, including the various Puranas, mention the samudra manthana legend, none of them mentions the spilling of the amṛta at four places. Neither do these texts mention the Kumbha Mela. Therefore, multiple scholars, including R. B. Bhattacharya, D. P. Dubey and Kama Maclean believe that the samudra manthana legend has been applied to the Kumbha Mela relatively recently, in order to show scriptural authority for the mela. This myth has been analyzed comparatively by Georges Dumézil, who connected it to various Indo-European myths and even the European medieval legend of the Holy Grail, reconstructing an original myth (the "ambrosia cycle", or "cycle of the mead") about a trickster deity who steals the drink of immortality for mankind but fails in freeing humans from death. Dumézil later abandoned his theory, but the core of the idea was taken up by Jarich Oosten, who posits similarities with the Hymiskviða. In this Old Norse poem, a sacred mead is prepared by cooperating gods and giants (who might respectively correspond to Devas and Asuras), with the gods ultimately winning the drink; the serpent Jörmungandr takes the place of Vasuki, although its role in the story is different. ^ a b Wilson, Horace Hayman (1840). The Vishnu Purana. ^ a b Kama MacLean (August 2003). "Making the Colonial State Work for You: The Modern Beginnings of the Ancient Kumbha Mela in Allahabad". The Journal of Asian Studies. 62 (3): 873–905. doi:10.2307/3591863. JSTOR 3591863. ^ Arvind Krishna Mehrotra (2007). The Last Bungalow: Writings on Allahabad. Penguin. p. 289. ISBN 978-0-14-310118-5. ^ Kama Maclean (28 August 2008). Pilgrimage and Power: The Kumbh Mela in Allahabad, 1765-1954. OUP USA. pp. 88–89. ISBN 978-0-19-533894-2. ^ Mallory, J. P. (1997). "Sacred drink". In Mallory, J. P.; Adams, Douglas Q. (eds.). Encyclopedia of Indo-European Culture. Taylor & Francis. p. 538. Wikimedia Commons has media related to Samudra manthan.